When looking to soundproof either a commercial or a residential area an acoustic sealant may be ideal for the task on hand. This is a professional grade item that is used widely throughout several fields of construction. It is without a doubt among the best thing you can do to truly soundproof an area professionally and efficiently while adhering to the overall projects budget. There are several sizes available for purchase. So you are never buying more than you need. It is created only for the use intended and makes no guarantees outside of its promise to be able to hold up to its intended use. It is important to not that a clean joint interface is critical to the performance of acoustical sealant. It should also be sound and dry. Acoustical Sealant is a non-skinning, single component synthetic rubberized sealant that does not harden. It offers great adhesion, and it is dark grey in color. With this being said, acoustic sealant is guaranteed in mechanical quality, but the color or appearance is not guaranteed. The quality of performance is also not guaranteed as that will vary upon precision and expertise in which it is applied. It is only guaranteed to work for its intended purpose. 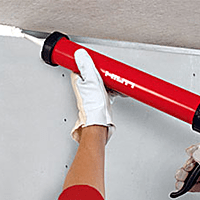 This is a professional grade sealant that works great on drywall, part walls and corridors. This is the most common sealant used for lap joints, and in countless other places throughout the construction industry. Anywhere soundproofing is needed, or where sound can travel through vibration or airflow this is a great option for use. There is no primer needed when using this professional grade sealant. This is a fantastic option when sound reduction is needed. Acoustical sealant reduces sound by minimizing air flow and buffer vibrations. It can be purchased in 10.1 oz, 1 qt, 20 oz and 5 gal sizes, and it does conform to Canadian laws and regulations. This saves you money by limiting additional supplies and being flexible in amounts available for purchase. In order to clean up this sealant mineral spirits or xylene is recommended. Proper veneration is required when working with this product. Again, this is not a hardening or rubberizing product; as its primary purpose is to reduce sound. It should never be applied to contaminated or damp areas. If you have any further questions about acoustic sealant,usage or ordering please contact us for more information.